The famous square, now the seat of some important buildings like Università Normale di Pisa, was wanted by Cosimo I to renew the medieval Piazza degli Anziani, also called Square of the Seven Streets because of the number of streets that start from it. Once upon a time, it was the seat of the foro Romano. The project, dated 1562, is of the architect Giorgio Vasari. The name comes from the Knights' Order of Saint Stephen, created by Grand Duke for the defense of the Mediterranean from the invasions of the Turks. Splendid buildings on the square were made for the purposes of the Order. In the center of the square proudly stands the statue of Cosimo I , as a Grand Master of the Knights' Order, made in 1596 by Pietro Francavilla. This square is the address of some of the most beautiful palaces in Pisa. 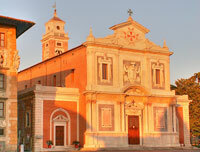 The church was constructed over the ancient traces of the church of San Sebastiano. It was made for the Knights upon the project of Vasari while the facade of marble was the idea Cosimo's stepson Giovanno de' Medici. Beside the church Vasari erected a bell tower. Apart from the imprint of the Order on the facade where's the stemma of the Knights of Santo Stefano, there are some other inside the church, which represent naval battles, Turkish flags, pieces and rests of ships. The palace of the Knights or Carovana (by the name of the training that knights had to do) is a wonderful building which owes its present look to the architect Giorgio Vasari. It was the seat wanted by Cosimo I for the Order and now it's the seat of one of the most prestigious universities in the whole Italy: La Scuola Normale Superiore. The only resemblance of the original structure is the slight bending. The facade of the palace is decorated with allegoric and zodiacal figures. The niches of the palace bear six busts of Medici Grand Dukes. The rests of the antique Palazzo degli Anziani is visible on the sides of the present building. The Library of the Scuola Normale Superiore saw the light of the day as soon as the Scuola itself was founded and is very important and integral part of it. The Library occupies two independent buildings from the XVI century, the Gherardesca Palace, also known as the Palace of the Clock and the Palace of the Capitano, as well as the part of the Palace Carovana. The actual building visible nowadays is the result of the reconstruction made upon the design of Vasari from the XVII century. The medieval towers were connected with a kind of the bridge and it became one single building. One of these towers was called the "Tower of hunger" because of the cell where Count Ugolino della Gherardesca was imprisoned and left to die of hunger. Dante described this episode in the XXXIII part of the Hell. 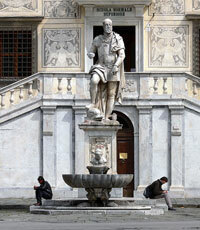 The statue of Cosimo I de' Medici is situated in Piazza dei Cavalieri in Pisa. It was ordered by Grand Duke Ferdinando I in 1596 to honor his father, as the first Gran Maestro of the Order of the Knights of Saint Stephen. It was made by the hands of Pietro Francavilla. Unfortunately, the statue was damaged in time and has some parts missing. 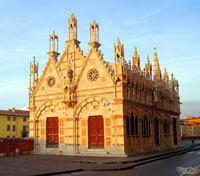 This small church, Santa Maria della Spina, is one of the most beautiful Gothic churches in Italy. It was first built in 1230, but due to a risky position, and possible floods from Arno, it was rebuilt in 1871 on a higher level. The name "spina", which means a thorn, derives from the fact that it guarded a part of the thorn from the crown which Jesus bore during the crucifixion. The splendid exterior of the church is composed of marble laid in polychrome bands. It is decorated with many statues, arks, rose-windows, sculptures. The interior, on the other hand, is more simple. Since the church is small, it has a single room. The church is mostly decorated by the work of the famous Pisan artists of that time, like Andrea Pisano and his sons, Giovanni di Balduccio, Lupo di Francesco.